This is for those Gals out there who do NOT have the time to do the much more labor intensive hairstyle I posted last week. This will take about 15 minutes to get into pin curls. 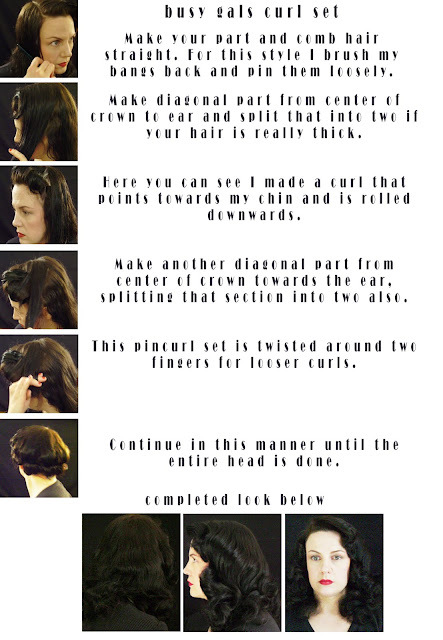 If you are not a pin curl lady you can use the same curl pattern with a large barrel curling iron. My curls don't last when I use curling irons so I stick to pin curls. Good luck Ladies! I love your blog! I really need to try and do these hairstyles - I get so frustrated with myself because I am not good at setting patterns, etc., and am pretty darn bad at using a curling iron! But one of these days (a lazy Saturday or Sunday) I'm going to try it out. P.S. - Your grandmother was BEAUTIFUL. I also spent a lot of time with my grandmother growing up, and thankfully, she is still with us and going strong at 83. We love to sit and talk about old classic movies and how life was lived back then. Thanks so much Ladies! I sure do appreciate that! Gorgeous. Your hair is so nice! Super blog, very beautiful post!!! This was incredibly helpful! I used it for a photoshoot and the pictures turned out fantasticly authentic looking! thanks so much you are a wealth of talent and vintage knowledge. To 'Confessions of a Girl Nextdoor' I would love to see those pictures! So glad these posts help. I don't know if you're still posting on this blog or not, but just in case you are, I have a question.. When you do the pin curls, is your hair wet or dry? Also, how long do you leave them in?